International Ticketing, International Tour Arranged and Hotel Reservation. - International Ticketing & Tour,- Hotel Reservation. Other Information: Travelling with affordable price. Category: International Ticketing, International Tour Arranged, Hotel Reservation, Travel Insurance. - Ticketing Domestic and International Flight, - Hotel Reservation and Tour in Bali, Provide Tour Guide for English, Japanese, Mandarin, Italy, German. Our travel agent has built a reputation on providing courteus, honest service. Our customer appreciate the way we do business and know you will too. Take a moment to call us and find out what makes us an exceptional place to buy an airline ticket. We make your travelling easy ! Category: International Ticketing, International Tour Arranged, Hotel Reservation. 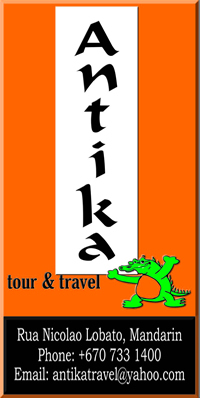 International Ticketing, International Tour Arranged, Hotel Reservation, Travel Insurance, Tour in Dili. Other Information: Make Timor - Leste to be the one of great destination in the world. Address: 101 Kitchener Road, # 03-38 Jalan Besar Plaza Singapore 208511. Services & Specialties: Ticketing Services, Inbound Services, and Outbound Services. Phone: (+65 ) 6388 8883. Address: Landmark Plaza, Av.Nicolau Lobato, Fatuhada, Dili, Timor - Leste. International Ticketing, Local Tour Arranged, Hotel Reservation. Other Information: Our place at Landmark Plaza 2nd floor and open six days a week. International Ticketing, International Tour Arranged, Hotel Reservation. Other Information: Your Professional Travel Service. Address: Avenida 20 de Maio, Audian, Dili, Timor - Leste. International Ticketing & Hotel Reservation. International Ticketing and Hotel Reservation. Address: Landmark Plaza 2nd Floor, Av. Nicolau Lobato, Fatuhada, Dili, Timor - Leste. Category: International Ticketing, International Tour Arranged and Hotel Reservation. Services & Specialities: - International Ticketing and Tour - Hotel Reservation. Other Information: Traveling with affordable price. Other Information: Please visit our place in Av. Dos Direitus Humanos or inside of the Orquidea Salon. Category: International Ticketing, Local Tour Arranged, International Tour Arranged and Hotel Reservation. Services & Specialities: International Ticketing, Local Tour Arranged, International Tour Arranged and Hotel Reservation and Airport Service. Other Information: We are the guide to your destination. Address: Timor Plaza, Avenida Nicolau Lobato , Comoro, Dili, Timor - Leste. With Harvey World Travel agencies located in all city centres and in many regional areas in Australia, you can be assured there will be a Harvey World Travel agency located close to you to handle all your travel arrangements. Services & Specialties: - All International Air Ticket,- Hotel Accommodation and Tours. Come and get the good price here for your international connecting flight......! !, Our place in Fatuhada ( in front of Australian Embassy ). International ticketing, Local tour arranged, International tour arranged and Hotel Reservation . - All International Air Ticket,- Hotel Accommodation and Tours. All about tour and travel. International Ticketing, International Tours Arranged and Hotel Reservation . 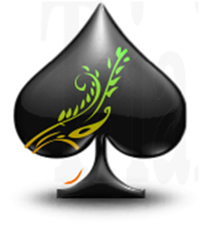 Ticketing Reservation, Hotel Reservation, International Tours Arranged. International Ticketing, Local Tour Arranged, International Tour Arranged, Airport Service and Hotel Reservation. Good price and discound for flight world wide and accommodation. Services & Specialties: - Ticketing, - Hotel Reservation, - Tour & Travel. Other Information: We are in Dili Beach Hotel to provide your best price and best service. Click here for Website or Other Photos and information Not Activated Yet. International Ticketing, Local Tour Arranged, International Tour Arranged. Providing abroad range of services in travel agent industry, such as ticketing,visa application and advise on documentations. We also specialise in organising group tours to various countries, we offer competitive prices to our travellers in a friendy manner. *Worldwide emergency medical &amp; Travel assistant * Medical &amp; Accidental Dental Expenses Incurred *Flight Delays *Travel Cancelation, Misconnection and Postponement * Baggage Loss and Delay * Home Content Protection During Trip * Personal Liability Abroad. We take you around the world, Visit our place in Audian or next to Timor Travel Agent. Address: Avenida Martires da Patria, Villa Verde, Dili, Timor - Leste. 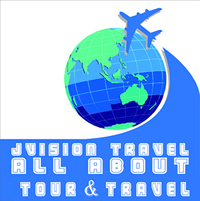 International Ticketing, Local Tour Arranged, International Tour Arranged, Travel Insurance. -Worldwide Air Ticket, - Reservation, - Insurance, - Hotel (Local). Services & Specialties: Insurance Provided, International Ticketing, Hotel Reservation. Other Information: Av. Direitos Humanos Lecidere Office Center Room11, Bidau Lecidere. Other Information: Open 9am - 7pm & 2pm Sat & Sun. Services & Specialities: International Ticketing, International Tour Arranged and Hotel Reservation. Other Information: We are ready to provide international and domestic travel agents for individuals and groups. International Ticketing, Local Tour Arranged, International Tour Arranged and Hotel Reservation. -Ticketing for Personal,Groups, and Corporate, - Tour out bound arrange, - Hotel Arrangements. Other Information: We bring the world to you. 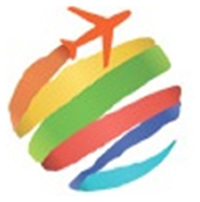 Services & Specialities: International Ticketing, Hotel Reservation, Cargo and Charter Flight. Continues to grow stronger through the unique service as the key to successful acting company. Avenida de Balide - Dili, Timor - Leste. Services & Specialities: International Ticketing arranged ( Local and Domestic ). Other Information: Make your next trip with us. Other Information: Located at Central Hotel - City Center. Bus Ticketing to Western of Timor ( Indonesian ). Services & Specialities: Travelling to cities of Indonesia parts. Other Information: Also packaging pareels to cities of Timor Tour & Travel Agent e.x. Kupang, Kefa, Soe - Atambua & Surabaya in Eastern Java. Services & Specialities: Ticketing jobs for any destination in the world at a lowest and cheapest cost. Other Information: We make your trip easy, enjoyable and add more comfort..
International Ticketing, Local Tour Arranged, Hotel Reservation, Booking car reservation, Airport Pick up. V.Sunny travel agent always with you and the cheaper price you will get. International Ticketing, International Tour Arranged, Hotel Reservation, Travel Insurance. -Worldwide Air Ticket, - Worldwide Reservation - Travel Insurance.